The most popular climbing vine in the country! Gives you gorgeous deep red color! Glossy leaves set the scene for the stunning flowers that follow—4-6" wide, in heavy bloom from early summer to frost. Climbs 8-12' with support. Plant to the east or northeast of the house, or mulch to keep roots cool. Bloom Time Midsummer, with sporadic blooming into early fall. Foliage Type: Rich green lobed leaves. Bloom Time: Midsummer, with sporadic blooming into early fall. Flower Form: Star-shaped flowers with pointed sepals, flowers up to 6" across. Planting Instructions: Plant 3" deeper than it was in the original pot. Bury the first set of leaves to encourage production for strong shoots. It also discourage clematic wilt. Pruning: Prune in late winter or early spring. All shoots can be cut back to the previous year's wood just above the base. Winter Care: Apply a winter mulch around the base of the plant to maintain soil moisture and cool soil temperatures. 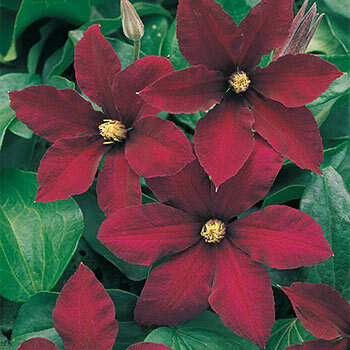 Additional Information: One of the best reds in the clematis genus. Holds its color well all season. Blooms on new growth in midsummer and then again on new shoots in early fall. The second bloom will produce smaller flowers.